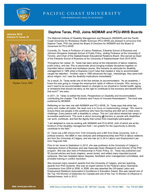 The National Institute of Disability Management and Research (NIDMAR) and the Pacific Coast University for Workplace Health Sciences (PCU-WHS) are pleased to announce the appointment to their respective Boards of Daphne Taras, PhD. Dr. Taras is Professor of Labour Relations, Edwards School of Business and Johnson-Shoyama Graduate School of Public Policy, visiting Professor at the University of Toronto, and Chair of the Saskatchewan Educational Relations Board. She served as Dean of the Edwards School of Business at the University of Saskatchewan from 2010-2016.